Apparently at some point in the last 24 hours, Blogger reviewed my site and made the decision that it wasn't a spam risk and unblocked my ability to post via an offline client. The last posts that I pushed through using Qumana published seamlessly. They had indicated that they would email me with a decision--no email, but who cares. I don't suppose I need MORE mail in any of my email boxes. Last night I did a little presentation for the Montana Peforming Arts Consortium (MPAC) in Great Falls, MT. I arrived late yesterday afternoon to a remarkably cold day. La Quinta, in Great Falls, had tried to order a cab for me. For what ever reason, Diamond Cab didn't send a car. So it was at least 45 minutes until I had a lift to the hotel. I actually shared the cab with two very nice gentlemen who comprise a duet called "Men of Worth." After arriving at the hotel, a very nice young woman ordered me a second cab. Despite the Civic Center being less than a half mile away, I didn't relish a walk in ankle deep snow with arctic temperatures. That cab never came either--HELLO DIAMOND CAB--and it turns out it is the only cab company in town. It seems to me that there might be room for a little competition. I presented TourWest for about an hour to a group of 30 or so staffers of about 10 presenting organizations and representives, agents, and artists. Mostly I was covering the requirements of the grant--but I also talked a bit about the technology behind the TourWest application--CultureGrants Online(tm) Basic. When I got back to the hotel, I flopped myself down on the bed only to find a razor blade on the top cover. I brought it down to the front desk. They were suitably aghast. My opinion is "no harm, no foul" but I did want them to know about it. This morning when I checked out, I found that the manager had covered the cost of my room and had an explanation. They are changing out windows and the workers are using the blades to take stickers off the windows. I think that the staff at La Quinta did a good job of making things right. This isn't a flaw in Qumana. It isn't a flaw with Blogger either. When I post to my Drupal site, the process is seamless. I type in the Qumana screen, edit, spell check, link, embed. The process is slick and quick. In many ways it is a better experience than typing into the blog itself. This morning, when I connected via DUN, and posted my previous entry it was lightning fast even on the Treo 650. In other words, I think that Qumana will ultimately make me more efficient. I may well load it onto my iMac at home as well as the portable I carry for work. So where is the nit? With Blogger, they have a spam blog detector. That is to say, if an application tries to interface with it to post something, it automatically sets it to draft. A window, bigger than the 15" on this MacBook Pro, pops up announcing that there was an error and you need to manually post your entry. It also gives a link to have your blog reviewed by a human being to remove the block. I laud Blogger for helping control spam. I also know that this is a minor irritation. I hope that Blogger finishes reviewing my site soon. A couple of weeks ago I finished updating TourWest for work. WESTAF uses its own CultureGrants Online(tm) Basic software to administer the program. I helped develop both the first version of this software many years ago and then, to rebuild it from the ground up about two years ago. It continues to be refined. CultureGrants Online(tm) Basic has all the general tools a grants adminstrator needs to accept applications, process them, create panel books, run a panel with scoring, fund, and communicate with applicants. It also has some basic reporting tools. This year I will be administering the grant program. It is focused on helping presenters pay artistic fees for artists from out of state. It includes a requirement that you must have at least one outreach activity after the performance. WESTAF digitizes all the support materials that come in using a ReplayTV--audio and video--and use HP Tablet PCs as panel books/media players for the panelists. Our panelists aren't faced with an enormous pile of paper when the panel book arrives. Rather they have a 1 inch deep screen that is roughly the size of a magazine. It is a process that has worked pretty well for the last couple of years. This will be the third year for a paperless process. If you want to apply, the guidelines can be found at the TourWest Online Application. It is pretty common for me to use DUN (dial up networking) on my Treo 650 to connect to the Internet via bluetooth. It is a handy tool to use when I'm on the road and there is no available Internet connectivity. DUN on a Treo 650 is SLOW. It can take forever for pages to render, some pages don't load quite right, and the connection is fraught with disconnects. This can make for an extraordinarily frustrating experience. Qumana can't do anything for me by way of Web based email, but it should allow me to post with relative ease to, currently, the two blogs that I run. Shortly, I will start blogging for the Second Life Non Profits that are setting up a non-profit commons and providing office space for non-profits. Given that I heavily cross post between my sites, this should allow me to engage all the sites I work on in a pretty seamless way. What does this have to do with the Treo? I am going to have to see how quick and painless composing off line will be and then posting using a slow, sketchy connection to my cell phone. That is what this post is all about. Qumana is a online/offline blogging tool that allows you to post to multiple blogs in one fell swoop. Given that I've been spending quite a bit of time since switching to Drupal crossposting to my old blogging site, http://imagespace.blogspot.com, I thought I would try this tool out. Add to that, that it is common for me to write when I have no Internet access. Rather than compose in Word and then cut and paste, this may end up being a better way for me to blog. It includes a text editor, that looks an awful lot like TinyMCE. It supports a ton of different blogging environments as well. This looks to me to be a terrific tool for Non Profits that engage in blogging. Qumana is available for Macs and PCs and is free. Today I wrote and sent a letter to the Direct Marketing Association. This stops the association from selling my name and information to direct mail houses and to email marketers. You can be removed in two ways. First, you can go to www.dmaconsumers.org and remove yourself. If you do this, they charge you $5. If you send the following letter (your information inserted of course) it costs $1. While they ask that you send a check, money order, or credit card number, the District Attorney recommended just stuffing a dollar bill in the envelope. Simple and quick. You have to put all iterations of your name for this to be effective. A few nights ago I attended the monthly PTA meeting at my daughter's school. The PTA is a 501(c)3 whose main mission is to raise money for an art teacher. As one can imagine, I am very supportive. My background is fine arts and I want my daughter to grow up well rounded with lots of experiences in the arts. What does this have to do with Identity Theft? From time to time the PTA brings in a speaker. This month it was a lawyer from the DA's office who came to talk to us about protecting ourselves from identity theft. He gave us a big booklet and an overview on what Identity Thieves are looking for--credit card applications, cheques, boxes of cheques, anything with a social security number, and so forth. Who are the most prevalent identity thieves? Meth addicts. They are desperate to not get caught and even more desperate to find money to feed the habit. What is the most prevalent way they get your information? Through your trash. The first step to protecting yourself is to get a shredder. Shred EVERYTHING that you might not want a thief to have. We use our shredded information to start fires in the Napolean Stove we have. Those ashes ultimately end up in our vegatable garden. Our information feeds tomatos. I am going to walk through, over the next few weeks, all the steps I'm taking to protect myself and my family. If you live in the United States, you might consider taking these steps with me. Tonight I called the Opt Out Prescreen toll free line. 1-888-567-8688. They have a Web site, but when I got there, the secure certificate could not be validated! How DUMB is that? So I called the telephone line. This service is like the National No Call list, except it intructs the credit reporting agencies to STOP selling your information to credit card and insurance companies who send you junk mail. It takes up to three months for the junk to stop coming--but it apparently works well. How nutty is this? They give you the option to opt out for 5 years or for life. 5 years? What are they thinking. In any case, the call took less than five minutes. The other thing that you can do is get off the telemarketer lists. While this isn't necessarily an issue for identity theft, it sure makes supper time more peaceful. You can get on the no call list easily by filling out a form on this Web site. I popped into my Gmail account today to find that I had been invited to join a group called Apple-computer-bloggers.com. Presumably I was invited because I do have a fair bit of content related to the Apple, Macs, and iPods. Often this content is related to the Arts non-profit community, sometimes not. Going to the site, it looks to be a news aggregator. It solicits content creators to insert RSS feeds into their site and aggregates that content into a single digestable source. If they can get enough Apple writers, it could become an interesting resource. I'll quietly continue my writing, allow it to be aggregated, and once again see how it impacts traffic or not. Second Life continually evolves. When Reuters opened up a news office, the playground took on a level sophistication that it hadn't enjoyed before. Other companies and services began to enter into the mix. We began to see galleries and clothing sellers. The economy of Second Life began to grow and now it boasts an GDP larger than some small companies. It was inevitable that countries would start to eyeball it. Sweden is the first--they are opening a virtual embassy. I am willing to bet that it will start out simply as an informational resource--but imagine, by linking it to the real world via the Web, they could set things up for application requests for passports. The office could become a real tool to encourage young tourists to visit the scandanavian country. After all, those who take part in Second Life are flush enough to own a computer and probably come from an affluent family. I think its a good move. It will be interesting to see how it all ends up playing out. I decided to do some sleuthing and dug up Steve's make and serial number. Steve is a 1958 spinet from the Cable Nelson piano factory. Given the overall condition, and the fact we know we are the third owners, that the previous owners had the piano for 11 years, I figured that Steve was probably 20-25 years old. The condition seems very good--there are a few nicks and scratches, but nothing horrible. The interior is clean and the mechanism seems to be in fine shape. Steve does need tuning pretty badly--especially after being hauled in a pickup truck about 30 miles in 40 degree weather. After the piano has sat for a few days and becomes aclimated to our home we will have a tuner over to give the little piano a good once over. I discovered that this model isn't anything special--a very average piano. Spinets are reckoned to be an entry level piano--but the size really was a plus to us. I've discovered that after not playing the piano pretty much for 20 years, I am VERY rusty. I guess we ought to figure out how much Steve is really worth for insurance purposes. In the meantime, I am delighted with our find. I have been pining for a piano ever since I moved to the United States 11 years ago. I had one as a child and had a marvelous piano teacher named Miss Canty whom I am still very fond of. She was a fabulous force in my life who has helped shape my life long love of music. 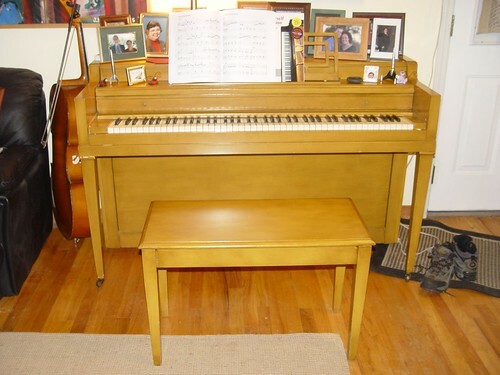 Paula noticed that a console piano was being sold at a GREAT price by a colleague. We snapped it up. Today, our friend Brendan and two of his hockey buddies--who move pianos for a music store--helped us get the piano from the old owner's house to ours. Pretty much right away our daughter named the piano.